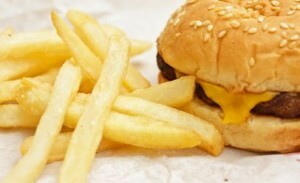 In a recent study, 91% of all kids meals at major restaurants were deemed unhealthy! That means that they did not meet the guidelines set forth by the National Restaurant Association’s Kids LiveWell program. This program put a focus on increasing consumption of fruit and vegetables, lean protein, whole grains and low-fat dairy, and limiting unhealthy fats, sugars and sodium. This is really surprising considering that the NRA lists 90 restaurant chains that are currently participating in the program. Big trends for healthier options for the kiddos have been seen on a national level. The National School Lunch Program has seen a major face lift for school lunches. Now all school lunch trays must have a fruit or vegetable. Plus there are restrictions on calories, sugar, and saturated fat. Positive changes such as requiring schools to serve lower sodium and making at least half of grain whole grain are now required as well. It’s no surprise that restaurants have not caught up to the school lunch requirements, which is a federally funded program with lots of laws and rules. However, restaurants are going to see a demand for healthier options for children. With the new menu labeling law that in effect, it makes sense for restaurants to start including at least one healthy option for youngsters and their parents. Many restaurants already have ingredients in their kitchens that they can use to create a healthy option for the kids menu. If you are a restaurant and need help, please contact Evaluate the Plate! We would love to be on your team. Highly interesting. Exactly what I was browsing for!